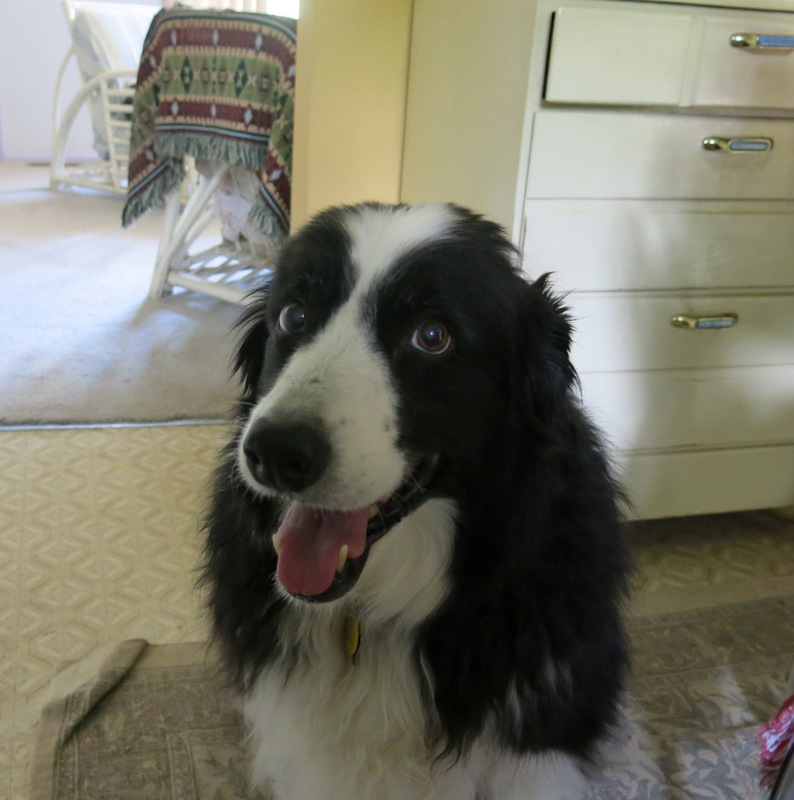 Hello yet again; it is I, Chess the purebred border collie, filling in for the guy I live with, and here to provide you with truly memorable posts. You may remember me from such posts as “On A Rampage” and “The Dog Days”. Here I am today, trying to look agreeable while the guy I live with is muttering to himself about all the work he has to do now. Besides shut the top drawer there, I mean. He made fun of me on our walk this morning, because Norm the coyote strolled right by and I wasn’t paying any attention at all, even when he said “Look, there’s Norm”, since I was staring at something interesting in the weeds. So now it’s my turn. It all started with the tree-sawing business yesterday, where he got all sweaty and complained a lot. He left these branches “for tomorrow”, which is now today, and nothing has happened except the branches were photographed, which doesn’t make them go away. Then in the middle of the night the guy I live with woke up, and Browning’s ridiculously ugly line (from The Ring and the Book) “leafage and branchage, vulgar eyes admire” popped into his head, and he doesn’t want lines from Browning floating around in his head any more than he wants to read things where apostrophes are used with plurals, or listen to people pronounce the word “agastache” as though they’d never heard the word “apostrophe” pronounced. The word “agastache” is, of course, a word in the English language, not Latin or Greek, so, no ugly Browning, please. The guy I live with feels about Browning pretty much the same way as G. M. Hopkins did, but with apostrophes. So we now have a surfeit of branchage. The guy I live with says that the Amur maple (Acer ginnala) featured above was struck by lightning, which it probably wasn’t, but he claims that’s “more romantic than saying it just died”. Whatever. Now he has a mess to clean up, and he’ll have to get all sweaty, which of course is pathetic. He says he could just leave the branches there, as sort of a Gothic ruin, but he has visitors coming in a few weeks, and I don’t think they’ll appreciate having to climb over a Gothic ruin, no matter how evocative it may be. 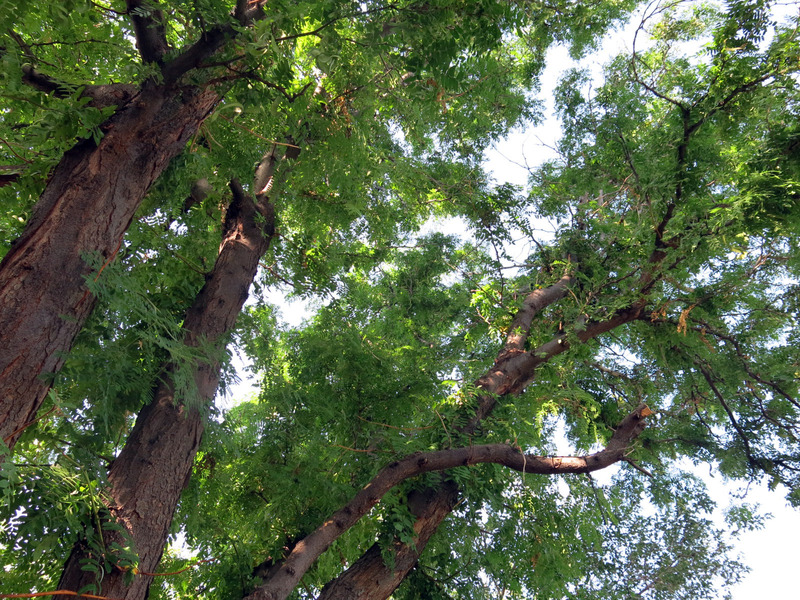 The Kentucky coffee tree (Gymnocladus dioicus), on top of which the hummingbird fight took place the other day, has a whole bunch of new leafage. The guy I live with says this is going to make more branchage, and he’ll have to saw that down eventually. I keep telling him that everything has an “eventually” but he says to focus on the tree as it is now, instead of droning on about what might eventually happen, so I guess I’ll try to stop telling him what he knows is going to happen. He’ll find out, eventually. 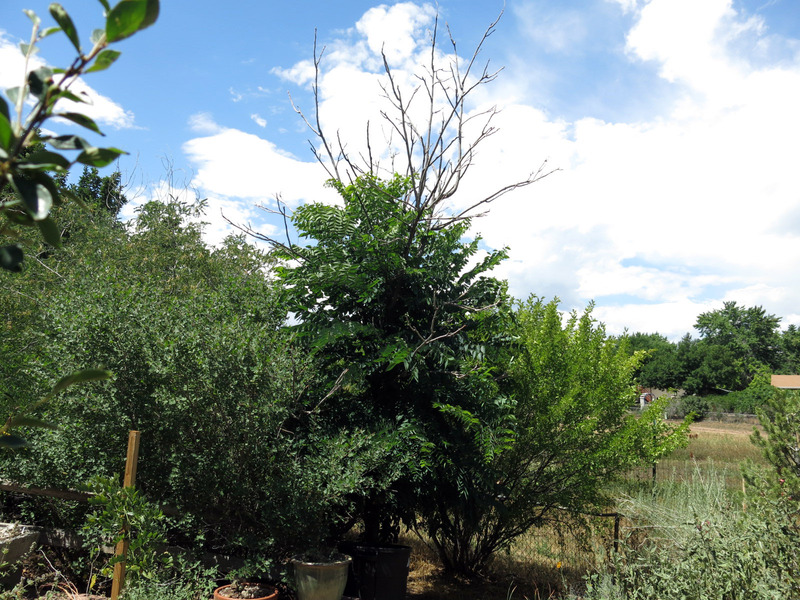 In the picture above you can dimly see some more branchage, on the left; this from a dead New Mexican locust (Robinia neomexicana), on which both hummingbirds and wrens like to perch, probably to survey their domain. 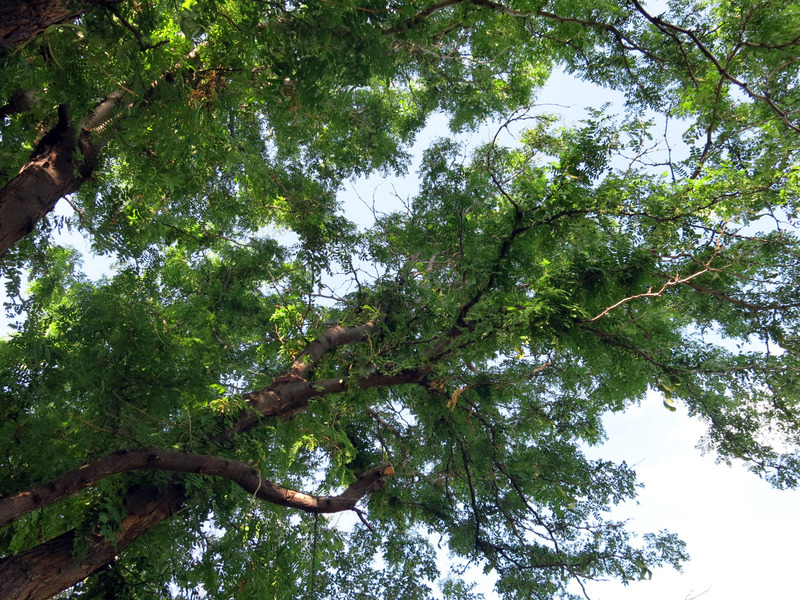 The largest manifestation of leafage and branchage on the estate here is the honey locust; this was here when the guy I live with and my mommy bought the house. It’s now a mess of branchage going every which way, leafage growing weirdly, dead stuff everywhere, and, to pretend to be Browning for just a second, to poke fun at the guy I live with, “poddage”. 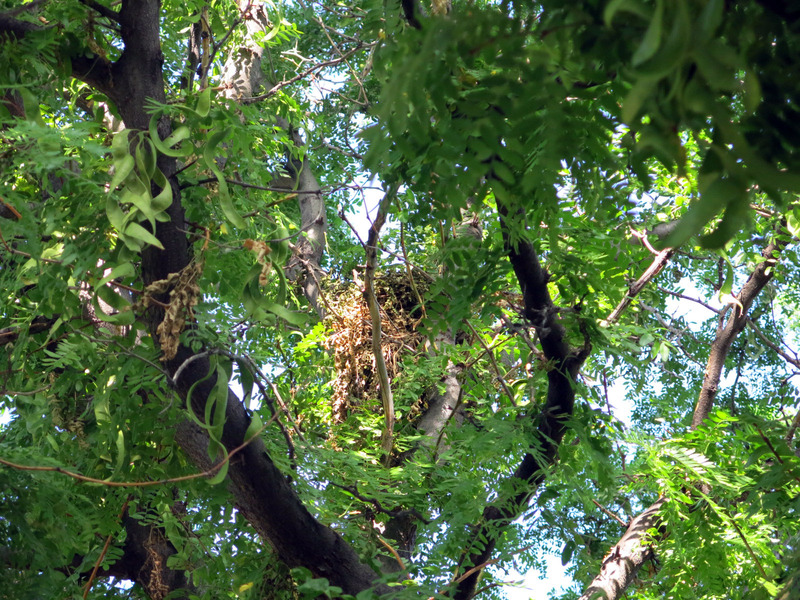 The rain of honey locust poddage has already begun, and the guy I live with dislikes having to pick them up constantly. He says picking things up makes him light-headed. So that’s it. And at least one nest. And the pods of which there’s going to be a rain of. The “rain of the pods” sounds like one of those sword-and-sorcerer things, if you ignore the misspelling. Like, “it was back during the rain of the pods when the king-who-was-to-come discovered that if you plant trees like this, or don’t cut them down before it’s too late, you’ll have a royal mess on your hands.” Which we have now. Poddage everywhere. The ripened pods themselves are quite tasty and my buddy Slipper showed me how to gnaw on them to get to the seeds. Okay, that’s about it for today. I’ve said “branchage” more times than I ever wanted to. I’d rather think of Hopkins, and his “dapple-dawn-drawn falcon”, and other stuff much less icky than Browning. 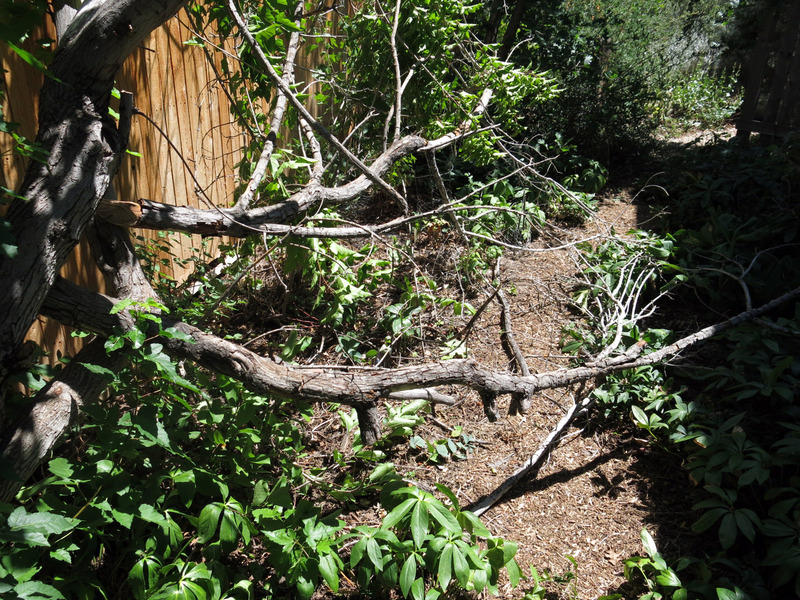 Unless some branchage falls on the guy I live with while he’s cutting it down, I’ll see you next time. This entry was posted in Uncategorized and tagged honey locust. Bookmark the permalink. Whenever I hear anything by Browning, Wordsworth, or Shelley, it makes me want to call that poet exterminator from MP’s Flying Circus. My arborist told me there was a fruiting inhibitor they can inject in the spring that will prevent the pods from forming. Come spring, I always decided to spend the money elsewhere and then regret that decision in the fall when all the pods are dropping. 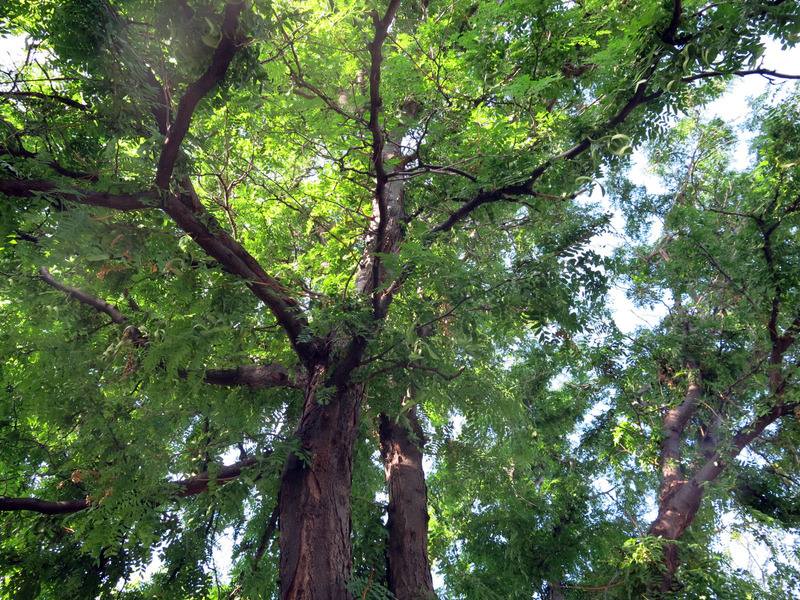 Can’t agree about Wordsworth or Shelley, but I do think honey locusts and other huge trees have no place at all in a garden. The problem is having the stupid thing cut down, and not having the garden and troughs underneath it completely destroyed. We’ll give Shelley an exemption for Ozymandias, but I could never get past Wordsworth wandering lonely as a cloud and dancing with daffodils. 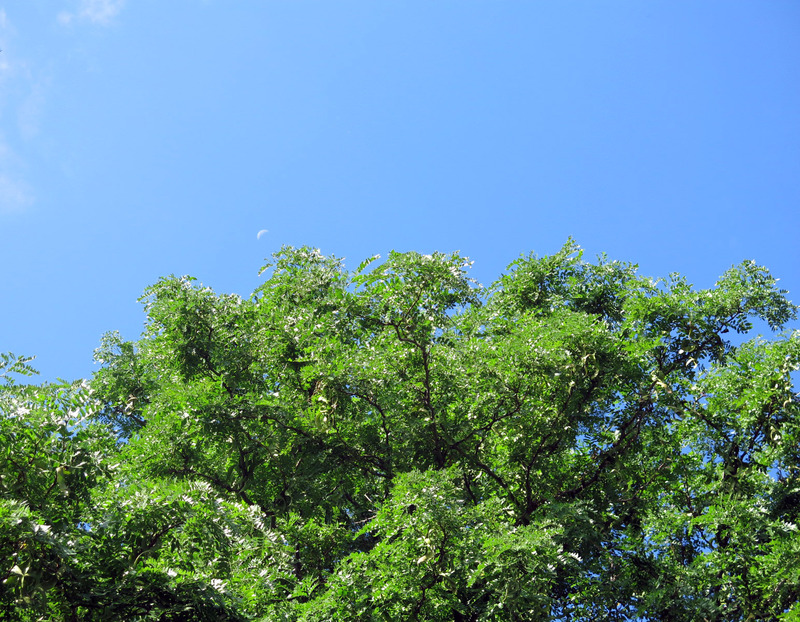 There are worse things than Honey Locusts: Siberian Elms, for instance. Oh, well, Wordsworth was lonely. And there were daffodils that day. It’s not worse than La figlia che piange. Or any of ten million poems written afterwards. I give the Worst Tree award to the silver maple. Or, Tree Most Likely To Fall On You Award. That. Face. That’s poetry. I wish people would learn to pronounce “mauve” correctly, but thankfully mauve had its heyday in the 1980s so it’s not the problem it used to be. I thought mauve had its heyday in the 1890s. I rhyme it with stove. So back to the nursery I drove.